Those who collect Vaillancourt Chalkware know the painstaking detail that goes into every piece of hand painted chalkware. 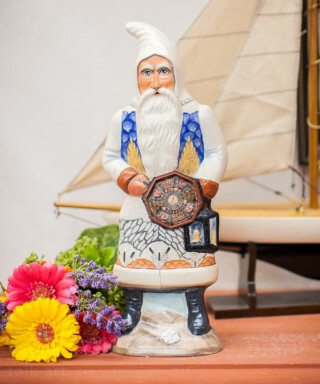 There is no exception when it comes to the ever popular Nantucket Santa Series which was introduced in 2008 at the Event Under The Tent–a summer show benefiting Nantucket’s early education school, Small Friends of Nantucket. When the first batch of Nantucket Basket Santas sold out immediately, Judi knew that the combination of detail, history, and nostalgia came together perfectly to remind collectors of the stress free summers. Now a series, these pieces are not just made for those with a passion for Nantucket, but for everyone who believes during the lazy days of summer. Apart from their extraordinary painting detail, many of these pieces also include decoupaged details from historical societies, hand carved and sculpted embellishments–including the famed Nantucket basket. The Nantucket Santa Series ensures that Christmas can be celebrated during the hot summer days.